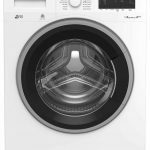 If you’re looking for Well Built, Energy Efficient, Award-Winning Washing Machine, geniously designed to ensure maximum protection of your laundry – The AEG L9FEC946R Washing Machine is for you. This top-of-the-range, German-quality AEG washing machine comes with a multitude of intelligent features, designed to make washing your laundry easier than ever. The way this AEG Washing Machine takes care of your laundry is truly spectacular. The engineers specifically designed this machine to ensure every fibre of your clothes is thoroughly washed and fully protected. The AEG L9FEC946R has an amazing ion-exchange filtering system that removes harmful minerals from your water, to ensure optimal protection of your fabrics. The OKOMix technology mixes your detergent and softener with water before it enters into the drum, ensuring only safe and diluted detergent makes contact with your laundry. Not only is this great for your fabrics but it also produces a deeper wash by giving every fibre in your load an even, and thorough wash. The ProSense technology uses sensors to weigh each load as it enters the drum, adjusting the wash times and water intake to perfectly tailor to each cycle. This prevents you from over washing your laundry and saves you money on electricity & water bills. But that’s not all, this AEG 9000 Series Washing Machine is packed full of life changing features. Think we’re over reacting? There’s good reason why this product won the 2018 Product of the year award! For starters, the ProSteam feature allows you to significantly reduce ironing time by injecting steam at the end of the programme, this makes ironing your load a lot easier. These steam features also include a short and gentle steam programme that easily remove odors from your clothing, or can be used to reduce creases in you dry fabrics. Now if you’re someone who finds themselves doing a lot of washing, this machine is perfect for you! Because it is rated A+++ for Energy Efficiency, making it great for your pocket as well as the planet! This is achieved via the AEG L9FEC946R Washing Machines “Inverter motor”, which is well renown for being incredibly durable, well-built and energy efficient. It has a massive 9KG drum, that we find is perfect for medium sized households (or small households that require frequent washing). And it’s available right now here at Herne Bay Domestics, with 100% Free Delivery & a Price Match Promise, meaning if you can find this product for even a penny cheaper for up to 7 days of purchase, we will refund you the difference. Plus the 5 Year Warranty provides excellent peace of mind.